How can a principal keep from feeling overwhelmed trying to improve teaching and learning? Form an instructional leadership team of teacher leaders to identify teaching and learning challenges in the building. Such a team builds its own instructional leadership skills while expanding your capacity. 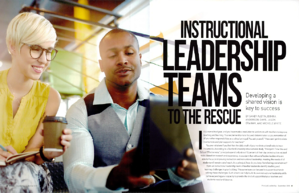 In the September 2018 issue of NASSP's Principal Leadership magazine, Sandy Austin, Donna Anderson-Davis, Jason Graham and Michele White explain how to put instructional leadership teams into action. They share five best practices for school-based instructional leadership teams along with lessons learned, advice, and links to three useful tools. Used with permission of NASSP/Principal Leadership. All rights reserved. Dr. Sandy Austin manages district partnerships and provides instructional leadership support for district and school administrators. She joined the Center for Educational Leadership after serving as an assistant superintendent and a school administrator for fifteen years. Sandy is interested in the link between instructional leadership and improved teaching and learning. She received her Ed.D. from the University of Washington in 2006.